Visual Quantum Mechanics -- The Next Generation developed a series of tutorials for science and engineering students. These materials have been tested in a typical "Modern Physics course that follows a two-semester calculus-based physics course. The print materials for these tutorials are freely available. However, some of them use software which is included in the Visual Quantum Mechanics package available from Ztek. Other do not use software or use software available on this Web site. The materials have been divided into four major categories. Instructors seeking materials at a level which is more advanced than these should consider Advanced Visual Quantum Mechanics. 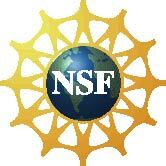 Supported by the National Science Foundation under grant DUE 965288.